This Valentine's Day pop sensation Rihanna won't be the only one who's been unlucky in love. After enduring an alleged assaulted by longtime boyfriend R&B star Chris Brown before the Grammy Awards, Rihanna has a lot going on under that "Umbrella" and probably has enough tears to need one. In an effort to show their support to Rihanna, Long Island, N.Y. Radio Station WBLI has invited members of Rihanna's Fan Club and other fans across the nation to join her side along with others who are unlucky in love. Appropriately held the day before Valentines Day (Feb.13), WBLI is having a "Shred Your Ex" party where thousands will happily shred Brown's CDs and posters as well as "lovely" mementos, photos or letters from ex-boyfriends, e-ex-girlfriends, ex-husband or ex-wives. In addition to having a real wood shredder for the occasion, WBLI will also be pulling Brown's music from the station all day on Friday. "Valentine's Day should stand for love so we find it fitting to make the Friday the 13th right before Valentine's Day a day for revenge for those who were unlucky in love," said Nancy Cambino, WBLI's operations manager. "Whether you're a Rihanna fan or not, we can all empathize with being with someone who caused love to go wrong." According to WBLI, 40 percent of Americans will be alone on Valentine's Day. New York has embraced Rihanna's music and the proof flows through the airwaves. "We have an excellent relationship with her record label Island Def Jam and have contacted her fan club. In fact 106.1 BLI has played Rihanna more than any radio station in the U.S.A. She is our #1 artist," Jeremy Rice, WBLI program manager told CBSNews.com. Not only is WBLI sticking it to Cupid, there is an important message behind the event. "We want to bring awareness to abuse and to help prevent it - and we're having fun with anyone's exes at the same time by shredding photos," said Rice. Rihanna and Brown are two of today's hottest stars. Rihanna holds the record for digital downloads last year and Brown was named 2008 artist of the year by Billboard magazine. There have been rumors swirling around that the couple had some relationship issues - appearing very happy and affectionate one minute and then upset and arguing the next. Shortly before the incident the couple appeared happy at a pre-Grammy party. Then at 12:30 a.m., they pulled up in a Lamborghini on a street. A witness told police they argued and it escalated, leaving the female passenger with "visible injuries." Celebrity lawyer Mark Geragos drove Brown to a police station where he surrendered. "If it's true - see Bernie Madoff, A-Rod - they are all terrible people! You don't hit women! You don't hit kids! I was an abused kid. It's not right," Rice said. Still, Americans are forgiving people, so maybe it will be just a matter of time when the dust settles and he is taken back - but like all exes, once you mess up, it is never really the same again. 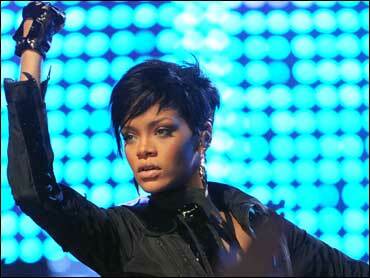 "Rihanna will continue to be a superstar. She makes hit after hit. Chris Brown is in trouble short term, but there are rock and hip-hop stars that have also done terrible things," Rice said. The "Shred Your Ex" party will be held Friday, Feb. 13 at 10:20 a.m. at the BLI Studios on 555 Sunrise Highway in West Babylon, N.Y.